Warm Weather Means It's Time To Get Outside And Click. Play. Social. Summer's nearly here, which means you're probably looking for the best way to stay fit and enjoy the warm weather. Turns out this sunny season is the best time to get active and make new friends at the same time! It's easy too—just sign up for kickball, volleyball, bocce or sailing with SF Social at www.sfsocialsports.com. SF Social is a Bay Area based co-ed sport and social club with an emphasis on the SOCIAL for young professionals. 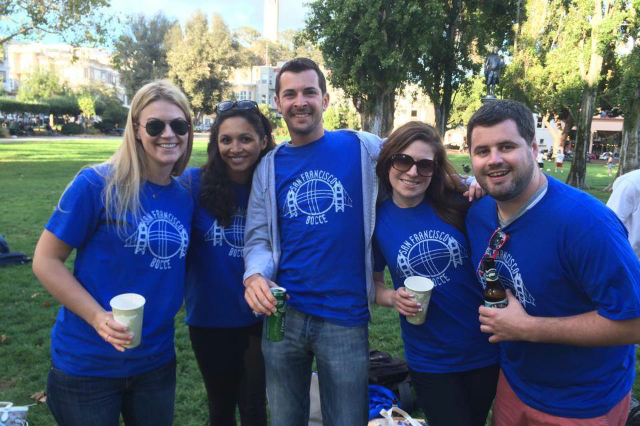 SF Social started as a 20-person bocce in Summer 2013. Now, they offer more sports and more fun. If you're a casual player looking to get a little active but you're tired of those uber competitive, win-at-all-costs leagues, SF Social leagues is for you! Perks include discounted food and drink prices at sponsor bars, and bar coupons for winning teams each week. The kickball league even hosts a mandatory flip cup face off each week—so make sure to bring your A game! SF Social offers leagues throughout the Bay Area, but the new Kickball league in Joe DiMaggio is sure to be a hit! Want to learn something new this summer? If you’ve never sailed before SF Social Sport Club’s Sailing league requires no prior experience! The Bocce league is an all-time favorite, offering beautiful views of sunset and social gameplay. You can join as a team, small group or friends or even solo and meet some new people! SF Social also offers corporate team pricing. To register visit www.sfsocialsports.com. Registration for summer closes June 29th, so hop to it! And if you register this week, receive $20 off your league fee by using the code "OUTSIDE". This post is brought to you by SF Social.